This is the best ever healthy chicken tetrazzini recipe with mushrooms, and herbs. It’s a quick put together in one dish meal. This whole grain Clean Eating tetrazzini pasta is a simple dish for everyone to enjoy. Anyone can make this recipe (as long as they have all the ingredients that it calls for). It calls for simple ingredients and you just cook the noodles and put it all together into one casserole dish and bake it for 25 to 30 minutes and you have a meal everyone can enjoy together! Everyone does meal prep differently, but I want to share a little about what we kind of do to make sure we are prepared for meals. Once a week we try to do all the shopping we need at various stores so hopefully (but doesn’t always happen) we don’t have to keep going back to the store. We decide what we want to eat each day for meals of the week and write it down and then make a grocery list based off of that. We make sure to check what we have leftover in the fridge that we can use for meals as well. Then we go shopping for all the food we need for that week. When we get home we try to do any food prep we need to do, for example, portion sizing or cutting up veggies or fruit for snacks. This way the rest of the week goes so much smoother and we can enjoy more time in the week to relax and not stress about meal prepping so much. If you really want to, you can leave the mushrooms out of this healthy chicken tetrazzini. Seems like everyone I know either loves or hates mushrooms. Since my husband hates mushrooms, I usually make one small pan for him without the mushrooms and he likes it fine. Although, I do think he’s missing out! 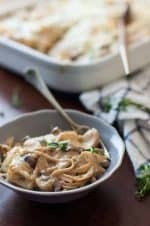 For this healthy chicken tetrazzini recipe, I love that I can make it the night before or in the morning and then throw it in the oven when we are ready to eat! Everyone does something different. What do you do in your home to make mealtime simpler? 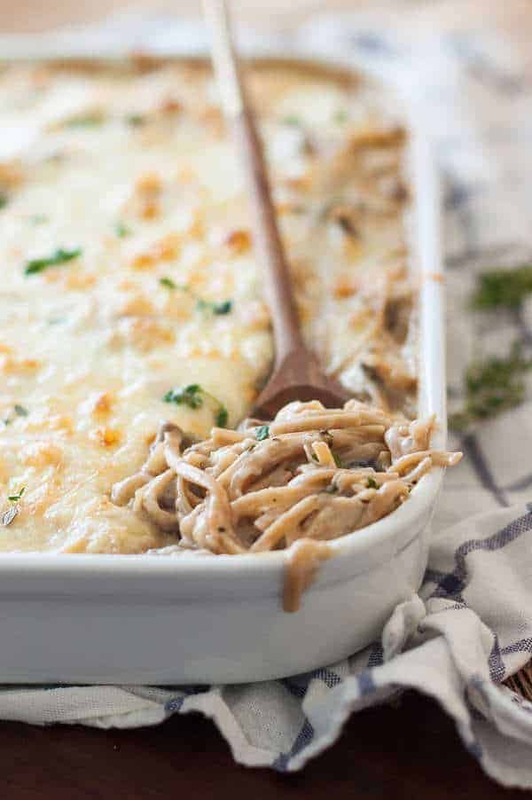 This healthy chicken tetrazzini recipe is so cheesy and comforting. I love the mushroom, chicken, butter, onion, thyme and cheeses together. My kids love this! Preheat the oven to 375 degrees. Lightly grease a 9×13 baking dish. ?Fill a large pot half way full with water. Season with 1 tablespoon of salt and bring to a boil. Add the linguine noodles, and give a quick stir. Cook according to package instructions, or until al dente. While the pasta is cooking?, add the butter to a large saute pan and melt over medium/high heat. Once melted, add the onion, mushroom, thyme, pepper, and sea salt. Saute until the onions and mushrooms are lightly golden brown, about 5 minutes. Add the flour and stir into the vegetables. Cook for 1 minute. Pour in 1 cup of the chicken broth and stir until smooth and thickened. Add the remaining chicken broth and the milk. Stir until smooth. Once the sauce thickens, remove from heat. Taste the sauce and add more salt, if desired. Gently stir in the sliced chicken. When the pasta is finished cooking, drain the water and place pasta back in pot. Pour the sauce over the pasta and toss until the pasta is well coated in sauce. Place the noodle mixture in the prepared baking dish. Sprinkle both cheeses over the top of the noodles and place on the middle rack of the preheated oven. Bake for 25-30 minutes, or until the sauce is bubbling and cheese is melted. I want to try this. All that cheese looks really good.